(This is a digital product, there are no refunds). It is highly advanced, and has an in-game interface, where you can control almost every aspect of the rotation. The Paid version comes with some unique features like the in-game interface, /commands and more. The hunter will move back if you are too close to the target to use your bow. This requires that the target does not have aggro on the hunter. 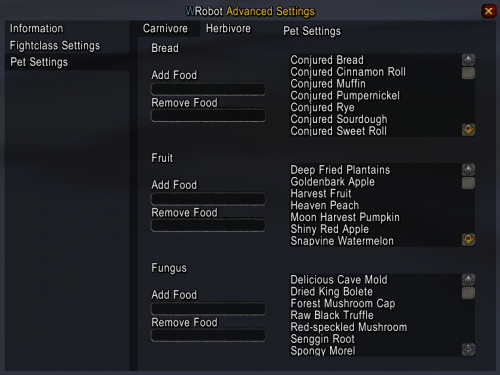 The hunter will feed it's pet if needed, and you can set the food in-game. This fightclass will save your settings between sessions, so if you set something example: Turn off Multi-Shot. Then next time you log on it will have saved that setting! You can even turn stuff on that is not yet learned. The fightclass will begin using the abilities when they are learned if they are turned on. - Volley Mob Amount <- Set the amount of mobs that needs to be in a group, to use Volley. - Feign Death <- Smart | Will only use this if pet is close to target and it will also wait some time for your pet to get aggro. - Disengage <- Will use disengage if you have an active pet, and a mob is targeting you in melee range. - Aspect of the Cheetah <- Will be used between fights, to get there faster. Wing Clip <- Turned off by default, as it's mainly used in pvp. 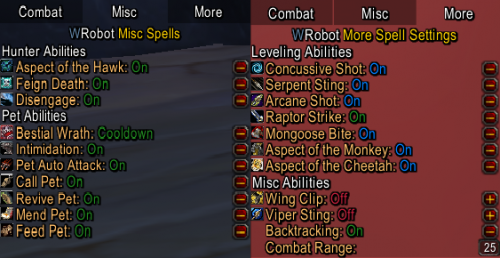 Viper Sting <- Turned off by default, as it's mainly used in pvp. Backtracking <- Turn on/off backtracking from mobs. Combat Range <- Adjust the range which the hunter will begin attacking mobs. (Default 25). - Feign Death Delay (Seconds): The number of seconds after a fight has been started, till the bot is allowed to use Feign Death (The higher the number, the more time the pet has to get aggro). These commands can be bound in-game by making a macro and adding to an action bar. Here you will find the answers to most of your questions. If your issue is not in this list, feel free to seek help in the support channel that fits the fightclass you're using. [Q]: The xml file is only containing 1 line of code, is this a scam? [A]: No, this is not a scam. All my fightclasses are encrypted, WRobot reads the encryption key then it loads all my code. [Q]: I have loaded the file, but nothing happens in-game (no interface).? 1) Your game client is not English. 2) Your WRobot is only trial version If it's not any of these two then get help in the support. 3) You have the settings stored from a pre v2.0.0, they are messing with the new version. Go to wrobot/settings folder and delete anything with "Ordush" in the name. 4) Your WRobot setup, has a setting set to something that breaks the fightclass. Try making a new WRobot install, in a new folder. [Q]: All other fightclasses works fine, why doesn't your? [A]: Most other fightclasses are not nearly as advanced as mine is. My fightclasses utilizes a lot more functions from WRobot. This means more can go worng with your install. Making a fresh install of WRobot is the safest bet to make sure nothing is wrongly set up. - Updated to latest dll files from wrobot. Ordush is the man when it comes to fightclasses. Convenient. Effective. Cheap. What else can we ask for? His Beastmaster is so damn good that I really thought about buying his other Fightclasses just for fun. I would not even need another hunter FC for Marksmanship. Or TBC fightclasses. But with the ingame interface and the very well working rotations it is just too much fun to bot with his FCs. Easily the best Developer for wrobot fightclasses. Go try yourself. It is an amazing fight class and totally worth it's price. Also pretty good communication with the creator, if something doesn't work as intended or for suggestions. Thumbs up! 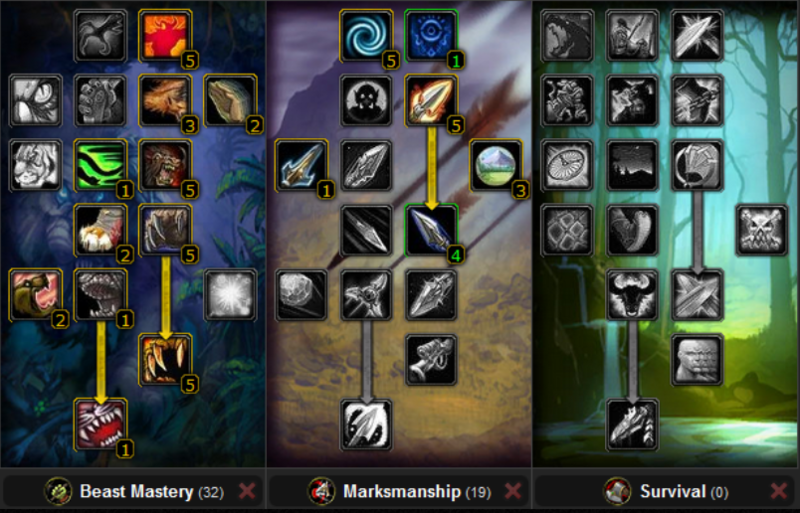 I was in ordush discord one day and he gave me the opportunity to beta test his BM and marksmanship hunter profiles... Now keep is mind people, I have bought his resto druid profile and his TBC hunter so I kinda expect something great and it's nothing short of that. His BM profile simply works wonders leveling and is miles ahead any fc on this forums. Now for MM the one I tried extensively... The hunter rotation actually does the rotation your supposed to do at 60... Aimed shot, multi shot and it weaves the auto shots into the mix. Overall don't miss out on this great piece of work. Much love ordush looking forward to your next project.